A small satellite powered by solar sails will be launched on May 20. If it works, the technology could lead to cheaper space travel, as it uses particles and radiation from the sun to propel itself. The craft, the size of a shoebox, will use a 32-square-meter kite-shaped sail made of wafer-thin Mayler. It’s not planned to enter the earth’s orbit though, as the designers are merely testing to see if the sail can be deployed successfully. 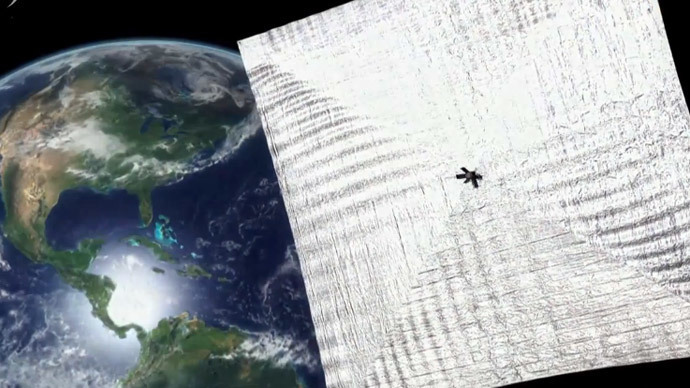 The giant sail will come out of a satellite known as a CubeSat. The satellite, a prototype called LightSail, will blast off on an Atlas V rocket on May 20 from Florida under the aegis of the Planetary Society. If it is successful, the organization hopes to launch a bigger version next year. This is far from being a new concept as it was first proposed around 40 years ago by the famous astronomer Carl Sagan, who spoke about it on the Tonight Show with Johnny Carson in 1976. "There's a tremendously exciting prospect called solar sailing, which travels on the radiation and particles that come out of the sun - the wind from the sun," Sagan said. "It works exactly as an ordinary sail boat does, so it can go out from the sun, it can tack inwards to the sun, and because it has a constant acceleration it can get you around the inner part of the solar system a lot faster and a lot more conveniently than the usual sorts of rocket propulsion." The Planetary Society, which was co-funded by Sagan, is behind the project. “We are going to explore space using a technology that was proposed about a century ago,” said Bill Nye, CEO of the Planetary Society, explained on his Kickstarter page. The organization has big plans and wants to expand on its initial May 20 project. It is currently trying to find the final $4.5 million it needs to fund a larger mission, which requires a bigger spacecraft. It is slated for 2016 and will travel into space on board SpaceX’s Falcon Heavy Rocket. "I'm proud to say we're about to realize Professor Sagan's vision," Nye said. "We have built our own light sail spacecraft - it's our own solar sail. "It's remarkable. We're advancing space science and exploration so the citizens of the world will be enabled to know the cosmos and our place within it." This is not the first time the Planetary Society has tried to launch a solar sail. Ten years ago, one set off on its journey to space, but never made it as the launch vehicle suffered a malfunction and didn’t get past Earth’s atmosphere. NASA and the Japanese space agency JAXA, with its IKAROS, have since managed to test the technology. However, the LightSail project will be the first privately funded attempt.